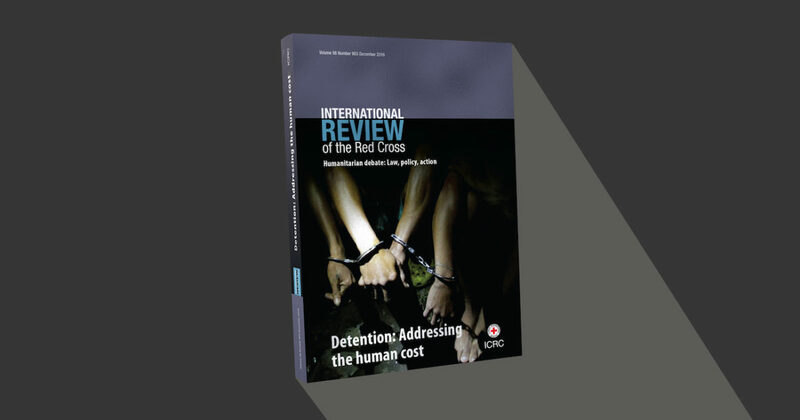 The latest edition of International Review of the Red Cross has been released—Detention: Addressing the human cost. This edition of the International Review of the Red Cross focuses on treatment and conditions in prisons and other places of detention, both in situations of armed conflict and in peacetime. We chose to address this topic in order to highlight the importance of treating detainees with human dignity under all circumstances. Deprivation of liberty carries with it human, social and financial costs that are born by detainees, their families, the detaining authorities and society as a whole. Despite these costs, societies often do not invest in improving prison systems or the infrastructure on which the human dignity of detainees depends. As I write in my editorial, the ICRC is aware that many challenges face prison administrators. They are often asked to implement complex policies, handle increasing numbers of prisoners and meet the apparently contradictory objectives of ensuring security and reintegrating prisoners. They frequently must do all of this without necessarily having the required resources. Sometimes what investment is made is directed towards resources for capture and arrest, rather than on improvement of standards for treatment and conditions of detention. This edition opens with an Interview of General Abdoulaye Kaka, who describes the measures taken by Niger’s Central Service for the Fight against Terrorism to ensure proper treatment and conditions while capturing, arresting, detaining and transferring accused ‘terrorists’. The contents of the edition give an overview of detention worldwide, beginning with a photo gallery of objects made by prisoners in contexts around the globe selected by Roger Mayou, the director of the International Red Cross and Red Crescent Museum in Geneva, where these objects are on display. The objects demonstrate that people’s life continues while they are detained and that even with very limited materials they are inspired to express their creativity, revealing a human potential that can be hidden from view. For some this expression is a matter of survival. Andrew Coyle, Catherine Heard and Helen Fair outline the major detention trends in their article, Current trends and practices in the use of imprisonment. They point to increased use of imprisonment and estimate that there are close to 11 million prisoners today, ‘of whom around half are in the United States, China, Russia and Brazil’, before breaking down imprisonment trends by region. Later in the edition, Paul Hathazy and Markus-Michael Muller look specifically at The crisis of detention and the politics of denial in Latin America. According to Hathazy and Muller, the symptoms of that crisis include overcrowding, deficient infrastructure, informal prison systems and violence, made worse by the political denial of these conditions. The focus is brought back to the costs of these trends by Megan Comfort, Tasseli McKay, Justin Landwehr, Erin Kennedy, Christine Lindquist and Anupa Bir in their article The costs of incarceration for families of prisoners. There they look at data collected on the financial, social and emotional costs of imprisonment of a family member, costs which these authors maintain often build upon each other and should be addressed simultaneously through support to families during and after incarceration. beyond the detained person and the correctional officer, who bear most of the consequences of overcrowding, police and investigative officers, judges, court staff, defense lawyers and public prosecutors, probation and parole officers, local authorities or even someone as remote as a prisoner’s neighbor or other witness are among the actors in stories of overcrowding. For Ballon, it is the responsibility of everyone in society to address the root causes of overcrowding in prisons. The next two short pieces come from prison authorities. Jail Superintendent Roy Panti Valenzuela, from the Bureau of Jail Management and Penology in the Philippines, describes measures undertaken to address the failure of the justice system to quickly process criminal cases, reducing the impact of prisoners held in custody due to the resulting bottlenecks. Similarly, Julian César Magán Zevallos, former President of the Peruvian National Penitentiary Institute, examines chronic prison overcrowding in Peru. He proposes that alternatives to detention be more frequently used and that different sectors of the Peruvian government work together towards a long-term solution. Unfortunately, sometimes ill-treatment, and even torture, occur in places of detention. Jonathan Luke Austin and Riccardo Bocco look at what factors might lead someone to become a torturer and how to prevent an individual from engaging in torture in their article Becoming a torturer: Towards a global ergonomics of care. Austin and Bocco propose that humanitarian and human rights organizations refocus to build a form of care for people at risk of becoming a torturer to ‘slowly but surely reduce the number of people making that transformation’. Also in this edition is a book review written by Olivier Chow of Richard Carver and Lisa Handley’s Does Torture Prevention Work?, which is based on an independent, global study of torture prevention measures and their impact. Prison conditions that are designed for the young and able-bodied pose challenges to elderly prisoners. Rachel Bedard, Lia Metzger and Brie Williams note that ‘the worldwide prison population is aging dramatically’, leading to new challenges for prison administrators. When detention takes place in connection with armed conflict, international humanitarian law (IHL) provides protection for detainees. In this edition, Zelalem Teferra takes a closer look at the safeguards in place when national security is invoked as a basis to detain during what he calls ‘one of the most traditional threats to national security’, namely armed conflict. More than 175 rules related to detention were designed to apply in international armed conflicts between States. In non-international armed conflict, where non-State actors are also involved, there are far fewer provisions explicitly laid out in Common Article 3 of the Geneva Conventions and Additional Protocol II. In his article, Strengthening IHL protecting persons deprived of their liberty: Main aspects of the consultations and discussions since 2011, Tilman Rodenhäuser describes the multinational work that the ICRC has conducted over the past years to strengthen detainee protection under IHL, in particular in relation to non-international armed conflict. The edition is enriched by two reports showcasing the ICRC’s work in detention, one from the present and one from the past. The ICRC’s report Protecting people deprived of their liberty explains why the ICRC visits prisons, what its delegates aim to accomplish during those visits and how. This is demonstrated in practice by the 1964 report by Georg Hoffman, Delegate General of the ICRC in Africa on his visit to Robben Island Prison in South Africa, where political prisoners, including Nelson Mandela, were held. This report complements the article by Andrew Thompson, ‘Restoring hope where all hope was lost’: Nelson Mandela, the ICRC and the protection of political detainees in apartheid South Africa, which looks to draw lessons from the late-colonial and apartheid era that are still relevant today. Thompson urges humanitarians and human rights activists to work together more closely, concluding that ‘it is in the domain of detention that the international community now needs to crystallize a new concurrence of approaches of humanitarian and human rights guarantees, not by ignoring their differences but by turning them to better account’. The edition also features two articles not related to the main theme in its ‘selected articles in IHL and humanitarian action’ section. The first, International humanitarian law’s old questions and new perspectives: On what law has got to do with armed conflict by Thomas Forster, examines the purpose and effect of IHL from the perspectives of economists, political scientists, historians and legal scholars. The second selected article is When is a conflict international? Time for new control tests in IHL by Djemila Carron, which proposes an alternate test for the control that a State must exercise over an armed group for the purposes of classifying a conflict as an international armed conflict. The edition closes with some regularly featured content. The biannual update on developments in national legislation and case law related to IHL, prepared by Estefania Polit from the ICRC’s advisory services covers the period from January–June 2016. In addition to the book review already mentioned, there is a review by Katie Shea of Simon Meisenberg’s The Extraordinary Chambers in the Courts of Cambodia: Assessing their Contribution to International Criminal Law and one by Ezequiel Heffes of Hyeran Jo’s Compliant Rebels: Rebel Groups and International Law in World Politics, followed by the ICRC library’s guide to new publications in humanitarian action and law. This edition should provide excellent reading material for humanitarians, international lawyers, historians, academics and others interested in detention. The next edition of the Review, dedicated to ‘Migration and displacement’ is scheduled to be published this spring.